Well on Friday I had MLK and it was interesting because they had a speaker who was teaching us about savings and what we can do to improve the ways we save. I had fun with my group because we did different activities and got to know each other a little more. I honestly can’t wait until the MLK Talent Show because it shows what talent that other young teens in Boston have and the fact that they aren’t afraid to show it is really brave. 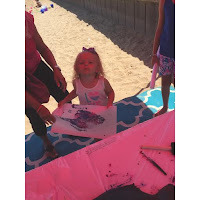 Yesterday was exciting at the Discover Quincy Beach Bash. 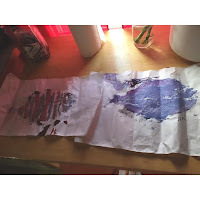 Rusenny and I were doing fish printing with the kids and there was one particular girl who was so cute trying to put the paint on but she was so little she couldn’t reach the table and her grandma and I were laughing. In the end her Fish Print came out really cute. Later on, I made a Fish Print of my own, and turns out it looked exactly like Dory, initially I wanted it to be pink but it turned out to be a nice shade of bluish purple. It was the first time I’d ever done a Fish Print and I can’t wait to do it again. 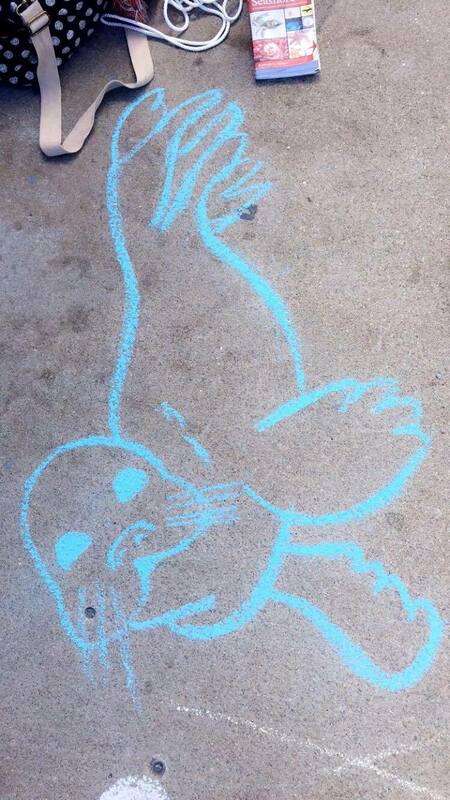 Towards the end of the Day, Pirate Mary Read told the kids stories of Boston, like ‘Hoover the Talking Seal’ and at first no one believed her, not even me but then she told us to look it up. It was just so fascinating because who would’ve known that an actual animal spoke. She also taught us about the Fish Scale Clouds and how they stand for a sudden weather change within 12 hours. It was a good day and the weather was beautiful. Just like Pokemon Go, with real treasure and real flights from JetBlue! from Nahant to Nantasket between now and Halloween it could be your lucky day. 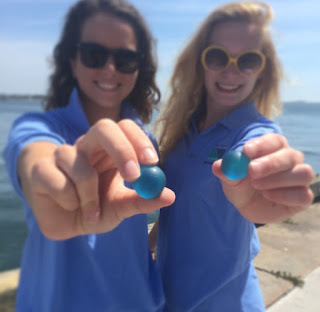 helped "release" 30 pounds of marbles on the region's public beaches. tradition that continues to bring fun to beach goers and treasure hunters alike. Boston, Dorchester and Quincy, and at the Harbor Illumination Festival in Hull. You can download a calendar of this year's events here. 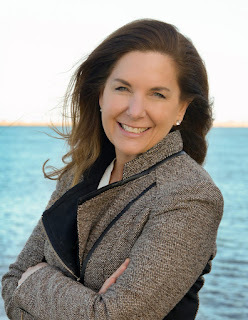 Program, follow @savetheharbor on Facebook, Twitter and Instagram, or visit their website at www.savetheharbor.org. First off, I want to mention that on Monday when we met the new kids, I got lucky and got another batch of kids who were either taking or took gymnastics. Within the span of 3 days these talented little ones have instructed me enough on walking handstands that I can now walk a few feet without my feet! Special thanks to Devy and Camilla for their gymnastic guidance. 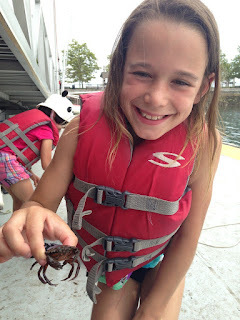 This week we were a lot more observant and found a lot of neat critters! 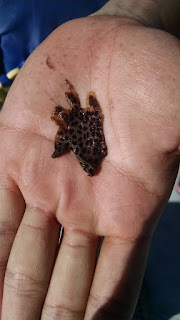 On my hand in the next picture is this weird patch we found on a mussel shell that I just ripped off. I have no clue what it is, but it looked awesome. 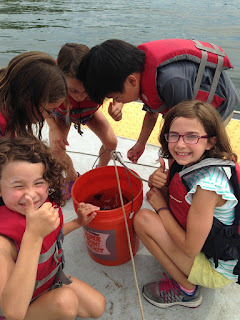 On Tuesday the staff and kids were very observant when we were prepping the crab traps. 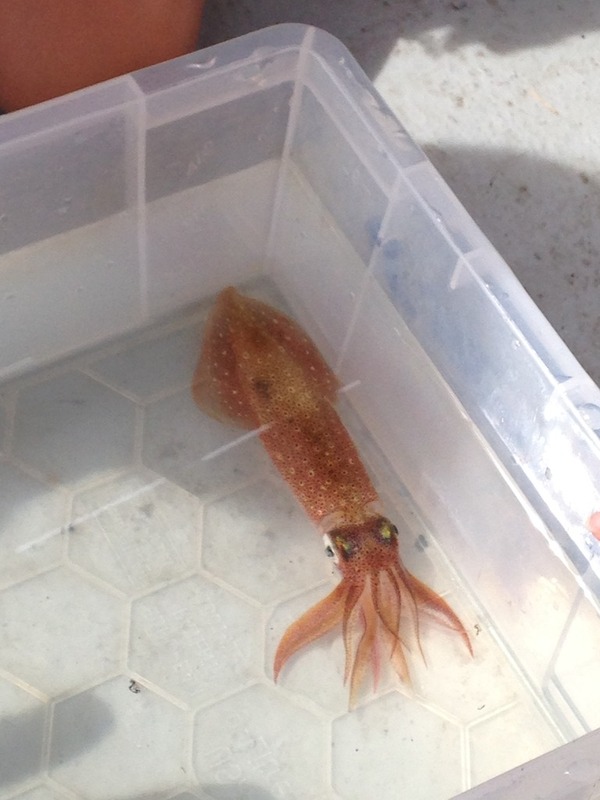 When we pulled one of the crab traps in, we somehow caught a juvenile PIPE FISH! It was barely over an inch long and barely thicker than a toothpick; it was by far one of the coolest finds in my book this whole summer. One of the kids named James shared the same ecstatic feeling as I did and quickly got him in a bucket in the shade for further examination. I wish I could have showed you guys this amazing little thing, but we ended up putting it back into the Harbor before we got the chance to snag a few photos. It was later that day that I did some research on pipe fish and the green little guy or girl that we had is a relative of Sea Horses and Sea Dragons. We also have noticed that on the mussel shells that we use as bait, there are often these small creatures that accidentally fall into our hands. On closer examination, we seem to have found these small shrimp-shaped creatures that are about a centimeter in size, small species of worms that resemble sea worms but without pincers, and these pieces of seaweed that seem to twist and twirl in place which the kids and staff (including myself) have nicknamed "dancing worms." We have seen a lot less moths in the past week or so, however flies have been on the rise! These flies are annoying; we have kids and staff alike getting nipped or poked by these flies! Believe it or not, but Sean happened to stumble across some molted snake skin that belonged to a small snake that noone has yet to spot in Pier's Park. Who knows what we will find next? I'll get more photos of these critters in the following blog posts! This week we finally caught something with a fishing rod: a Squid! Joe, who is now hands down one of the best fishermen we have had in the program snagged the little critter with the help of Grace (Senior Harbor Educator)! Just before we released the squid back into the harbor, it managed to ink Sean right on the chin. 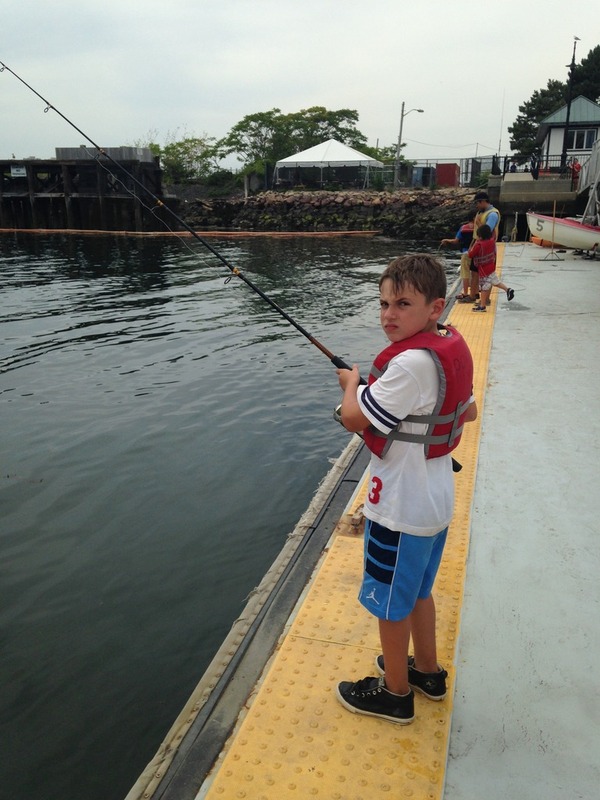 Thanks to Joe, the other kids were inspired for the rest of the day to try their luck in fishing! In the coming photos you will get to see the determined faces of the kids who wanted to catch something for themselves. 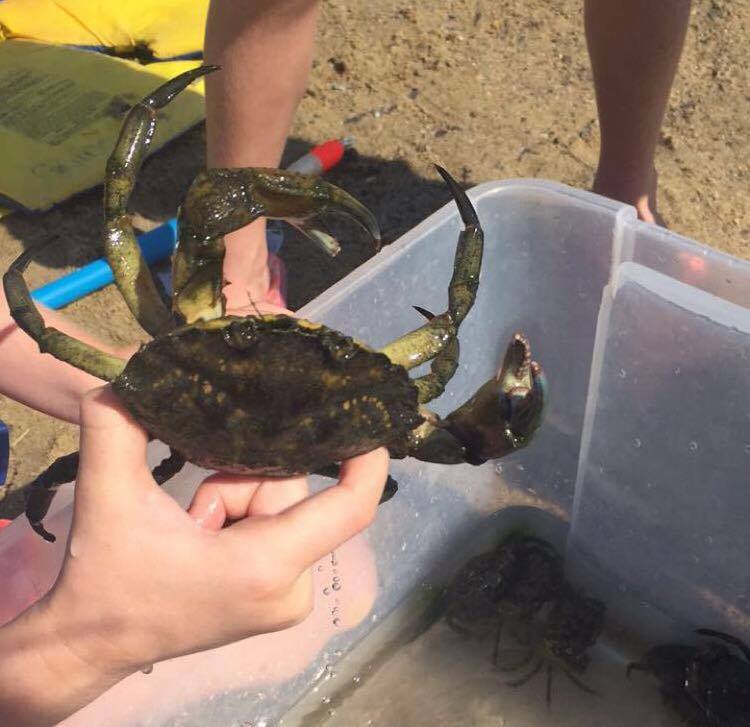 On the same day we found two pregnant crabs and saw that their eggs were of different colors. One crab had orange eggs that looked just like salmon roe, and the other had eggs that were more of a dark brown. At first I hypothesised that the orange ones were probably fertilized and that the dark brown were duds. After some very brief research, Ary and I came to a conclusion that the crab eggs change colors over their life cycle and they start off as orange and they end up brown as they near their "due dates." 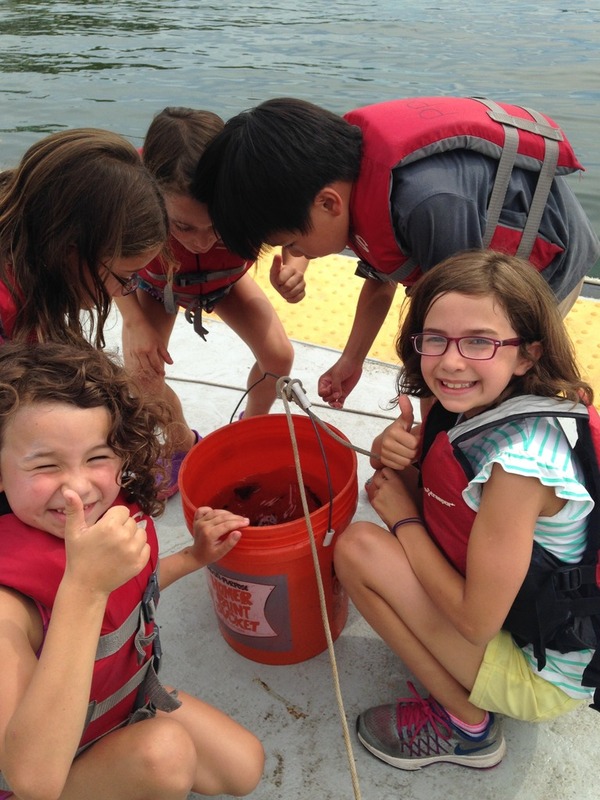 This is a picture of some of the crew releasing our little squid friend back into the harbor! I'm looking forward to telling you all about the other critters that we'll come by in the next coming blog posts! Through this past week In Carson the tide was low, low to the point where it looked disgusting even felt disgusting. Besides that it was an opportunity to go clamming in the area where it was low tide. I decided to tag along with Joe and Abel although I was the only one wearing shoes and with black jeans as well. It was hard to move in that area with the kids flinging the mud and clay everywhere with the tools they were given to use. 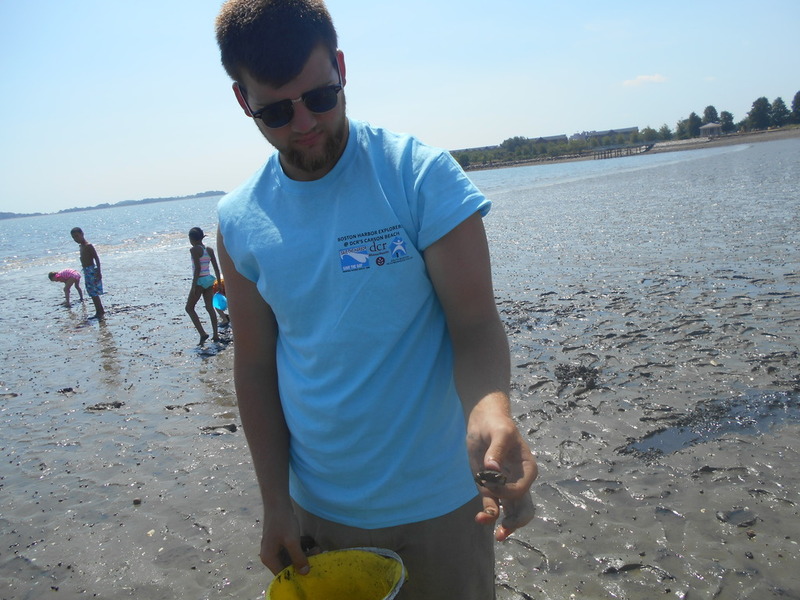 After only a few minutes the kids found a clam while Abel and I found a broken piece of a clam, here's a picture of Joe holding the clam that the kids found. A few minutes later we decided to tread deeper into the area which was where I had to leave due to the fact that my shoes made me feel like I was walking in quicksand. The question of how to clean my shoes then came and I honestly didn't know what to do, but after running up to the beach the sand covered all the mud on my shoes and after a few minutes all the mud was gone and what was left were a few marks of mud but that was easily removed by more running through the sand. In the end It was fun that I got to join in on the clam hunting but what I kinda still regret was that I had my shoes on. Need A Doctor At Spectacle! Good afternoon everybody, last week on Thursday I got injured again because when I was splashing water at everyone I stepped on a shell. It was really painful when I stepped on it. I jump out of the water as fast I could to see my toes but people thought there was something in the water but I said "Someone call a doc my toes is injured I got a shell hooked to me". I took a big huge breath and pulled the shell out of my toe as fast as possible. At the end of the day, I enjoy swimming at spectacle when is a sunny or rainy day. I'll still be in the water waiting for people to enjoy there self in the water on a sunny day. 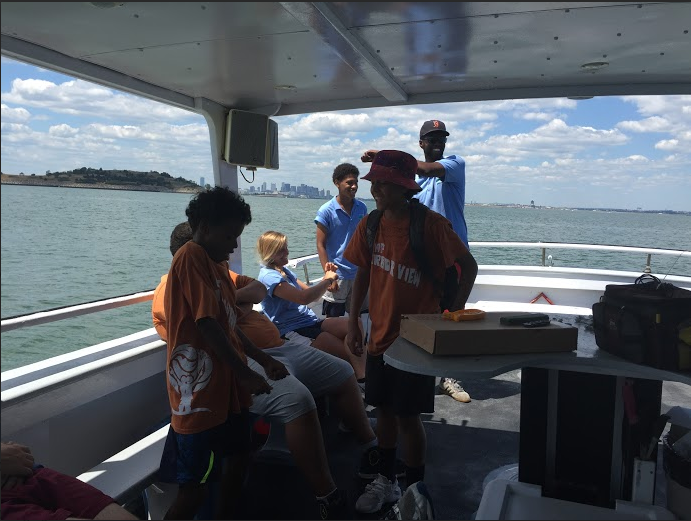 My best memories at Spectacle Island is being on the boat, kids and I playing quack a dilly o my. It's a game where everyone is around in a circle and everyones gotta put their hand on your partner beside you. A lot of kids like to play the game with me because I am the number one of the game I never get defeated by no one but there will be like 20 somethings kids that want to face me but I give every kid a chance to beat me. 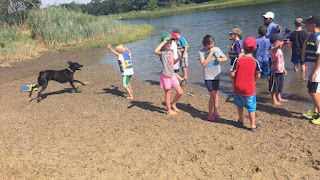 Hey everyone it's Mauricio again back with more from Camp Harbor view! I have been having a blast so far this summer and the kids have been super into everything we've been doing at CHV. Wednesday, July 27 was the date of our second fishing trip. This fishing trip was one to remember. Not because of the fish we caught but because of the jokes and awesome communication going on between us and the campers. We hadn't been catching a lot of fish so the trip ended up being a bust , but we still had fun at the end of the day. It is said the reason why we didn't catch that many fish is because of a banana! A silly banana caused our troubles. It is a fisherman myth that if someone on board the vessel is eating a banana then it won't be a healthy day for fishing. 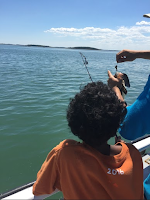 Even though we didn't catch many fish the kids were engaged in talking with the staff , cracking jokes and just having a good overall time. The best thing is they never gave up trying to catch fish either! They were determined to get their catch and they defiantly deserved it. 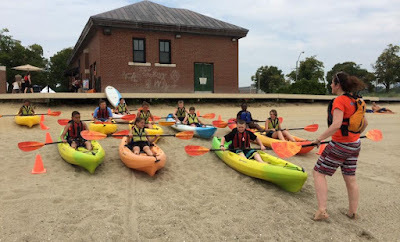 This week, I got to spend the day at Piers Park in East Boston for the first time. I didn't know what to expect since I had never been to the site before, but I had a lot of fun! In the morning, we started the day off with a fun game in the grass as the kids arrived, and then we went into the tent for a lesson on the ocean's ecosystems. As a science teacher, I was excited to see the kids asking questions and sharing their knowledge about the ocean! We talked about kelp forests, seagrass meadows, and of course, coral reefs. We also discussed how humans are threatening these ecosystems, and how some of them may not be around for us to enjoy in the future. While this is certainly not the most uplifting topic to talk about, I was happy to see the kids engaged, curious, and interested in learning what they could do to help. 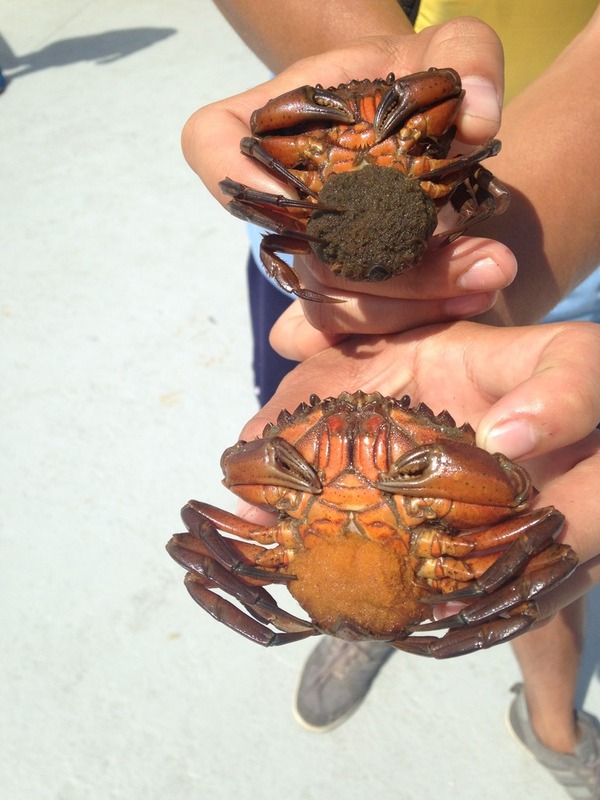 We went to the dock in the morning and managed to catch a few crabs that appeared to be pregnant! We released them back in the water after snapping a few pictures and spent the rest of the morning fishing and kayaking off the dock. After lunch, we went to the park and got to cool off in the sprinkler while playing with the kids. We even got a visit from the ice cream truck! Since it was 90+ degrees outside, it was awesome to spend some time in the sprinkler. After that, we played an intense game of capture the flag, then returned to the dock for more fishing, crabbing, kayaking, and sailing. 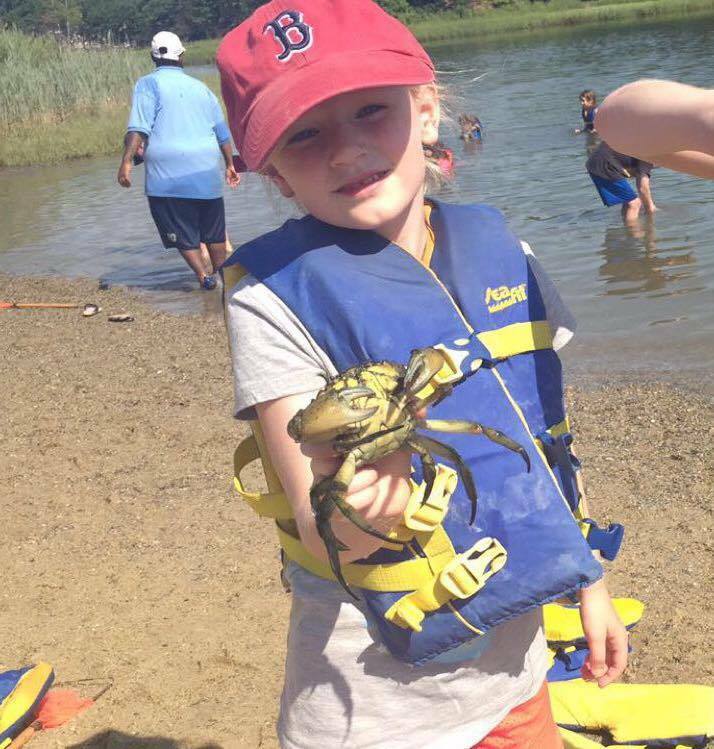 At this point in the summer, I have witnessed kids catch fish at Community Boating on the Esplanade, but I myself have not caught anything. 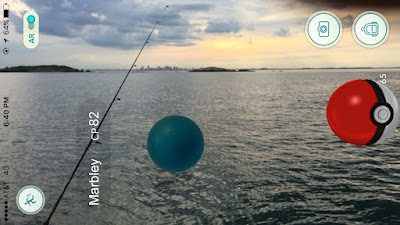 At the end of the day at Piers Park, however, I finally reeled up a sea creature on my fishing rod! 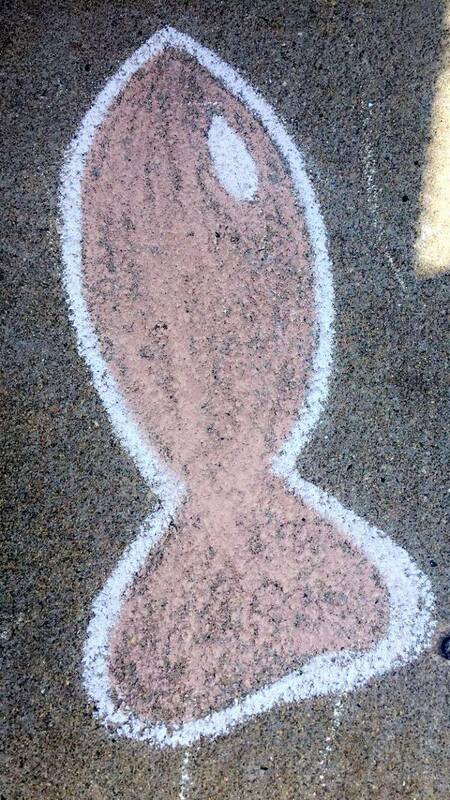 At first, I had no idea what it was, but upon closer inspection, it turned out to be a squid! 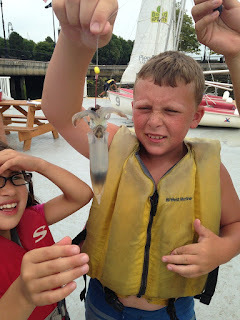 We were so excited to have such a great catch, and the kids were really curious about the squid. It ended up squirting some ink as we tried to take it off the hook, and it even changed colors from white to red as it swam in the touch tank. I didn't even know that squid lived in the harbor until that day! After doing some research, I think the squid was an Atlantic long-finned squid. I think it's really interesting that the squid could change colors and shoot ink as a defense against predators. I also learned that squid are used a lot in neuroscience research because they have very large neurons. We released the squid back in the water after the kids spent some time looking at it, and at the end of the day, many of the kids told their parents that we caught a squid! Overall, it was a fun day at Piers Park, and I'm looking forward to hopefully catching another cool sea creature next week! I am always so exited to share with you all how amazing and smooth everything is. Its always great at Blacks Creek. We always have new things happening everyday. This week we caught the biggest crab we have ever gotten at blacks Creek, and the weirdest thing about it was that we didn't even put any bait on the crab strap. It was pretty big, the kids all wanted to touch it and see how big it was (it doesn't look big on the picture thou). On Thursday, we had a special friend at the Creek. Someone's dog was there and the kids took the initiative to play with it as the owner showed up. They played catch with him,trowing the ball from here to there. They all wanted to play with the dog. I am terrified of dogs but this one in particular looked very friendly. However I was distant because I get scared when I see dogs running around with a leash. ( I was chased by a god when I was about 8 years old, that is why I do NOT like dogs). 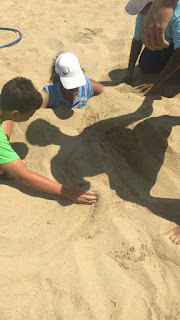 We also had a very particular sand design this week. One of the kids wanted to do something different so she designed this very nice sand design that she liked very much. I did too. We honestly never get bored there because we always find new things to do and explore everyday. Therefore Blacks Creek is so special and I am deeply in love with the nature and the kids and everything surrounded by it. 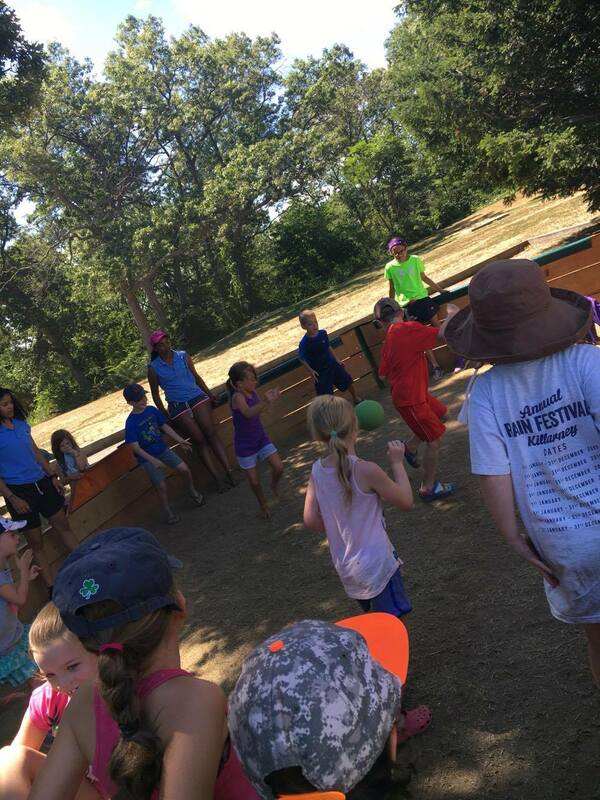 In the past week at Blacks Creek, we've been inspired to try out a few new games to entertain, amuse and get kids (and staff) moving after snack time. First was Sedny's contribution, a game called "Blink Killer," which involves a lot of dramatic "deaths" and some serious detective work. "Victims" of the "Blink Killer"
On Tuesday, after telling our group that day about the jellyfish tracking app, I taught them the repeat-after-me Jellyfish Song (with accompanying dance moves), which was surprisingly popular: "Arms up/Wrists together/Elbows together...Do the jellyfish, the jellyfish, the jellyfish-fish" etc. What a week! We've been catching creatures all summer at Piers Park, but not until recently have we caught any fish. 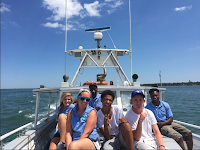 At the end of last week, our Harbor explorers discovered a tautog in one of our crab traps. It was small, but the biggest of the fish that we've caught so far; about five inches long, brown, with black stripes and blotches down its back. It also had a long fin that ran down the entirety of it's spine, and human-like teeth! 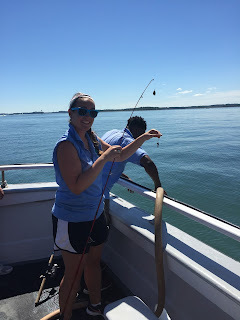 Next time we catch a tautog, we will get a picture of it smiling! Yesterday, we found a bunch of new types of fish. 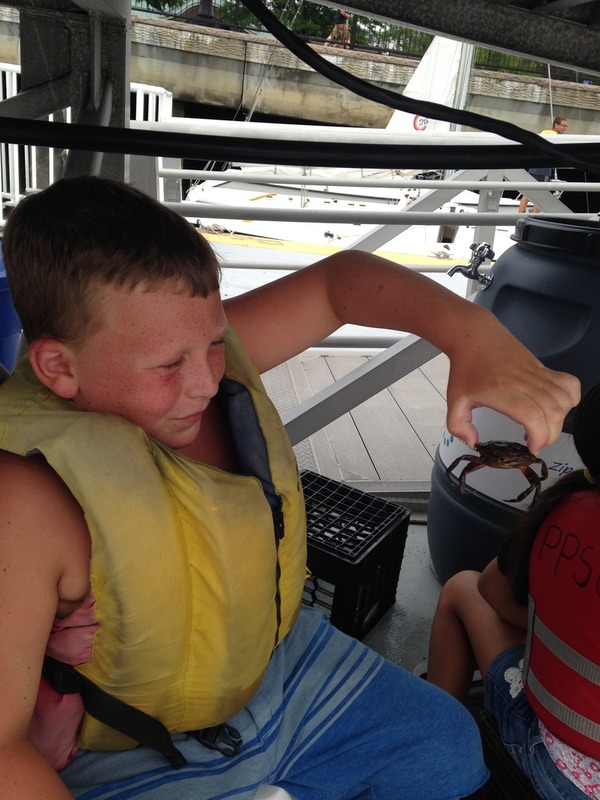 Earlier in the day, in another crab trap, the kids pulled up a small flounder! This fish was about an inch shorter than the tautog. We put it into a touch tank so that the kids could learn a thing or two about flounders, first hand! The kids gently touched the flounder and noticed it's slimy skin. They were also surprised by how it swam. Unlike most fish, flounder swim parallel to the seafloor, touching the bottom's surface. They are flat and brown, so they are almost undetectable in their habitats. In the touch tank, it's dark scales were clearly visible, and we were able to observe the way that it moved around. It was a great start to the day. Now, this next catch may seem a bit fishy (ha), because I was the only one to witness it happen, but I promise, it really DID happen! I've mentioned in previous blogs that sometimes for bait, we'll lie on our stomachs, reach under the dock and grab a handful of mussels.Well, on Wednesday I did just that, and as I was standing up, a very small fish fell from my hand, flopped on the dock for a second, and then bounced back into the water and swam away. I was shocked! Whatever type of fish it was, it must have been feeding off of mussel meat. I know I didn't technically land the fish and it got away almost immediately, but it touched the dock, and in my book, that's an official catch. So, I literally caught a fish with my bare hands, no big deal. The ecosystem under the dock continues to amaze me, and has been slowly revealing itself throughout the course of the summer. At the end of the day, just as we were leaving the dock, we pulled up another small fish in a crab trap. This was the tiniest of the bunch, and we immediately let it go because we were pressed for time. 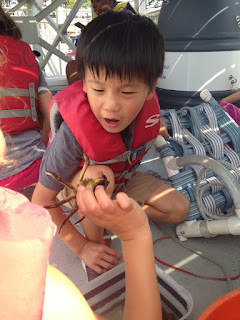 It looked like a very small striped bass, and the kids were able to touch it and hold it briefly. They were the most excited after we placed it into the water and it swam away. And for the grand finale of this week, today at Piers Park, for the first time, we caught something on a fishing rod. Arguably the coolest and most interesting thing we've caught all summer, it was awesome. Read my next blog to uncover what we found, I'll tell you all about it! I hope everyone is having a great time. It's been a really good week at Blacks Creek, as always. This week so far we've had a lot of fun. 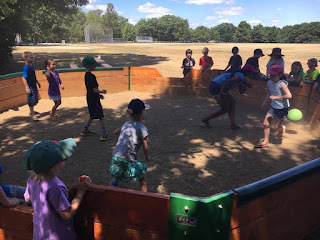 We played a different game called Gaga Ball. The game is very fun. All the kids loved it. Basically, it's very similar to kick ball but instead you can't get the ball to hit you above your knees and you and everyone else is inside a hexagon-shaped enclosure and everyone is kind of hitting the ball to one another and try to take them off the game. 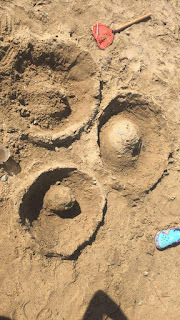 The kids loved the idea and kept asking for more and more rounds until we had no more time to play. Everyone was having a great time. I enjoy watching the kids having a good time: It makes me feel satisfied. This week was also very fun at Carson. I let some kids bury me in the sand but then got stuck and couldn't get out. I thought the other staff wouldn't help me out and felt like I was going to be there for a while. It took us a couple of minutes to actually get me out. But the funny thing was that when people were passing by they were all surprised and laughing as if they have never seen such a thing. I looked weird, too, because it looked like I was standing up but only my shoulder and up was showing. You would not see the other part of my body. That was something new: I've never been buried in the sand before and honestly I don't even know how I agreed to let them bury me. But life is to experience new adventures every day and that's why I love my job! Then on Tuesday at Courageous, I found out my new talent: I can actually draw! No. I'm kidding; but I'm not bad at it. I want to share my pictures with those that didn't have the chance to see. 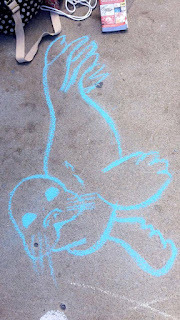 It all started off when I was coloring with the kids, so I said instead of coloring I will just start from scratch and make my own seal design in chalk. And so I did and it was pretty exiting because they loved it. You never know if you're good at something until you try. Therefore I'm happy to say that I try new things everyday and therefore I'm discovering new things about myself that I never knew before. Well, I hope everyone is doing great and having the best time ever! Well this week at Spectacle Island has been an interesting week. On the first day at Spectacle, nobody really wanted to fish, the groups that had signed up ended up cancelling. 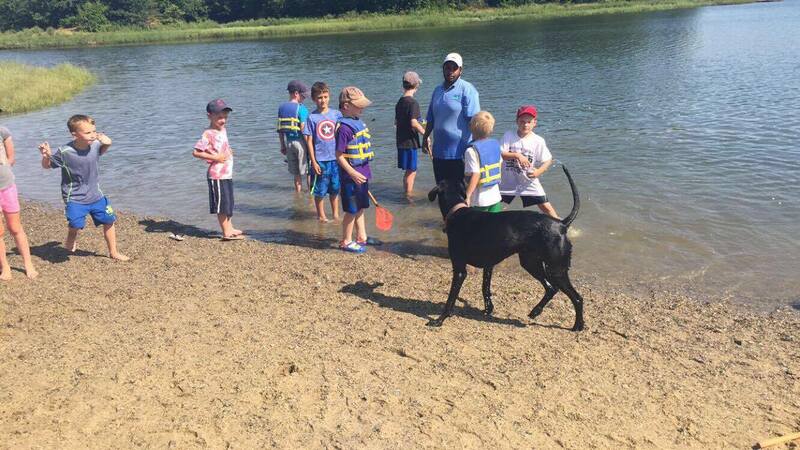 Everyone wanted to either swim all day or play sports. But yesterday and today was a complete different story. The kids would go swimming for a bit then from a distance you could see a group of them coming down to the dock yelling "I want to fish! I want to fish!" Many of them were awesome at casting the rods into the water.. Others, well.. lets just say thank God nobody lost an eyeball today. Some kids would just wave the hook around among other kids and it was kind of a scare for me. "No don't do that!" Others would almost throw the whole fishing rod into the water while trying to cast. Aside from those struggles, I tried my hardest to teach each and every one of them how to properly cast without hooking anyone or getting tangled and I can say it was much of a success. This week has been a week of learning more about fishing for me too. I learned how to tie the hook onto the rod (kind of taught myself after minutes of struggling). And there's something about just casting and waiting and hoping to catch something, that is very relaxing. I think fishing is one of those activities that teaches you a whole lot of patience. We haven't caught anything here yet, but I know we will soon! All it takes is patience and dedication! We got this! So, if you've been keeping up with any of my blogs, you'll notice a trend. 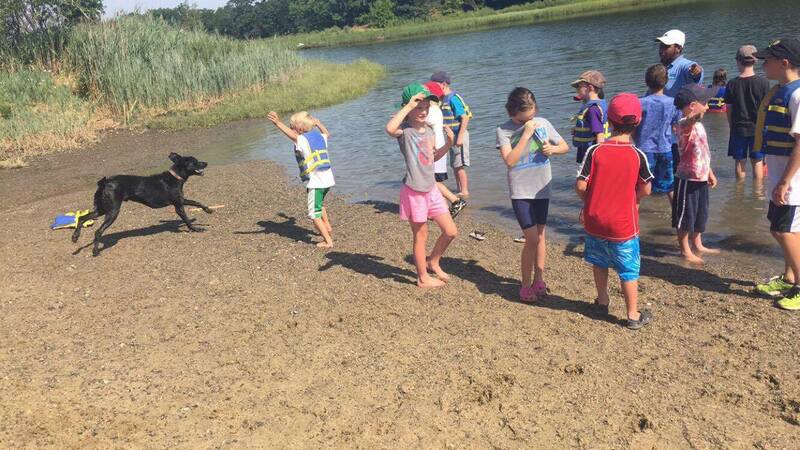 Every single cool thing I've talked about has happened at Carson Beach. I mean, everything that happens at Carson Beach is exciting so can you blame me? But in reality, until yesterday (Wednesday), it was the only site I'd had the pleasure to work at. Early this week, when I heard that there was another fishing trip for Camp Harbor View, I volunteered to go. When I was told yes, I was beyond excited not only to work with some staff members I do not get to very often, but also engage with new faces and do new things! We don't really fish at Carson, and halfway through the summer, I was dying to give it a go! After collecting the campers and getting ourselves together, we made our way to Captain Charlie and Sam's fishing charter. 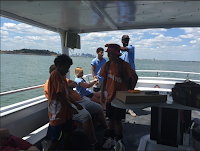 The kids were clearly excited, and it was awesome to be able to see the kinds of bonds they'd made with the Harbor Explorers prior to that day. Well. We get going, heading out into the depths of Boston Harbor. I was a little hungry. I say to Kristen, "Hey, do you think it would be weird if I just ate a banana while we're heading out there?" She laughs and says, "No go ahead!" So I take my banana out and begin eating it. I then hear Sam say "You are NOT really eating a banana right now, are you?!" I stared at him in shock and said, "Yeah." He tells Charlie to turn around. Captain Charlie sees me, rolls his eyes and yells, "Peel overboard!" I say, "Wait, really?" and Sam says, "Yes. Really. Otherwise we won't catch anything." Well I whipped that banana peel SO fast over the side of the boat and could not stop laughing. I think Kristen and I had tears in our eyes. Fast forward to us anchoring in our first (of over a handful) fishing spots. I watched Sam bite the head off of a seaworm and spit it out before showing everyone how to bait the hook. Gross. I dropped my line and waited. I moved to several spots around the boat, as I did not want to either get tangled with another line, and also, I wanted all the fish for myself! Well. 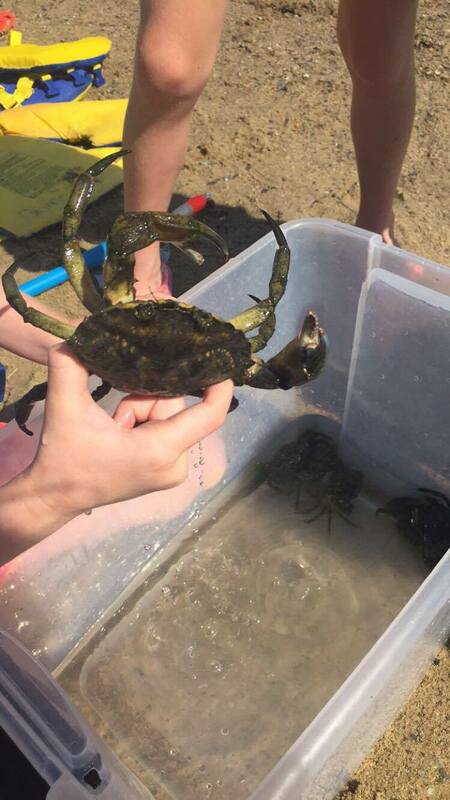 The only thing I managed to catch all day was a huge chunk of seaweed and a missing seaworm via a crab! Sigh. But the others' luck was not much better. Only two flounder for keeps, among some skates and some flounder that were not big enough to keep and had to be returned to sea. On the ride home, sitting with my friends and fellow explorers on the bow, Kristen and I recounted the banana story to all. We decided that although that may not be the real reason we had an unsuccessful fishing trip, it was sure a great story to tell! And, if hanging out with new friends and faces and laughing is an unsuccessful day, then count me in! Yesterday was a perfect day to go out fishing in the harbor, and we did just that. Our bi-weekly fishing trip with the CHV fishing club got off to a slow start, but that does not mean that the excitement was lacking. We had a few returning campers that joined us on our last trip aboard the Belle, and that experience that they brought with them on the trip, allowed them to keep spirits up and made it so each and every one of us enjoyed ourselves. As we motored out to the spot in the Harbor where we had the most luck last time, it was time for the staff to have their breakfast. I pulled out my bagel, and one of my coworkers pulled out a banana. Now I had never heard this superstition before, but it was a huge deal to Captain Charlie and he told her to throw it overboard. There are many different varieties to this story, but the one that is most widely accepted is the tale of bad bacteria being carried on a historical fishing boat that caused the entire crew to get sick. Nowadays, fishing boat captains are extremely careful not to have any bananas on board, and this can even spread to products that carry the word "banana" in their name. I felt silly having been fishing this whole summer without knowing such a widespread superstition about the sport, but of course now I know that you will never find me snacking on a banana near the harbor. As we continued to look for good fishing spots, we dropped our lines and were getting a ton of bites my smaller fish. This got the campers from CHV pretty excited and we were able to reel in a few flounder for them to take home. Since it was a pretty slow day, our boat ride consisted of a lot more interaction with the kids whether that be in the form of chess, ice breaker games, or just telling jokes. Although we didn't get to take home as many fish as last time, our fishing club had a wonderful time during their day on the harbor. After working at Camp Harbor View for the first three weeks of the summer, I got assigned to All Access. Even though I was sad to leave Camp Harbor View, I was excited to start working at a new site with new people. Working at All Access is very similar to being at Camp Harbor View, for a couple of reasons. One reason is the large amount of campers we work with at both sites, and we do similar activities at the two sites, also both sites are very close to each other. 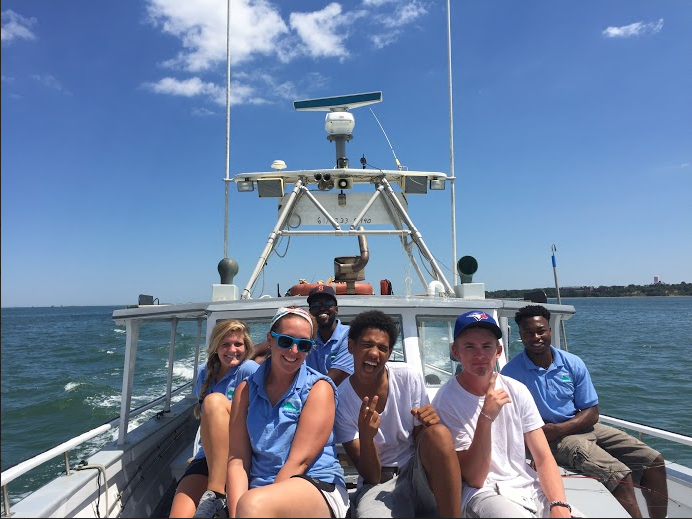 When I first learned I was working All Access I wasn't too disappointed since Camp Harbor View had prepared me for what All Access had to offer. 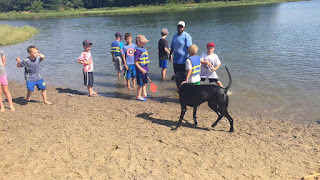 There's only a couple of things we do during All Access that we don't do at Camp Harbor View, one is swimming and the other thing is playing sports. Unfortunately I wasn't aware that we all swim during All Access(while at Spectacle Island). When I told Dave and Andrea, that I couldn't go into the water since I didn't have a change of clothes, they weren't too happy. So when I started walking along the water Andrea filled her water bottle with water and then dumped it all over me, next Dave came and tackled me from behind and while I was pinned to the ground Andrea once again filled her water bottle and poured water all over me. Other than this one unfortunate incident, All Access was filled with fun and exploring. Carlos and I played a very competitive game of soccer, which was very fun. I also got to enjoy my first time on Spectacle Island with a quick walk around the island. Not too long ago a young boy was fishing in hope to catch something big and stunning. He wanted to catch something no man would ever forget. He want to catch a shark! He pulled up the reel, put it down and pulled it back up then threw it in. He gave up and sat down for a bit, but he never gave up on what he was striving for. As soon as he came back and pulled up the reel there was something all right! We thought it was just a piece of trash from afar then we took a closer look and it only looked more of a sack of eggs than what we originally thought it was. We got a magnifying glass and saw that there was some type of organism inside for sure. As we were looking at it and saw sienna floating around we pretty must thought it was either shrimp, mosquitos or even fish. We knew it had to be something! It was slimy and just not the best thing to hold. I hope one day we find out what it really is. The young boy although determined to catch a massive sea creature, he did not. Whomp, whomp!